My impression is that it's a somewhat widespread misconception that S&T magazine publishes only old-school, hex-and-counter wargames. That this isn't the case might be demonstrated by the football game Scrimmage, which appeared in S&T issue #37. But if you think that's a sound argument, you're wrong: The designer of Scrimmage, S&T editor and prolific wargame designer Jim Dunnigan, actually superimposed a hex grid on the gridiron! Talk about being true to type! Still, what's wrong is not the claim but the evidence. S&T has published no small number of games unadorned by the apparent ineluctable ubiquity of the hex grid. To prove the point, here's a list of S&T games that broke the stereotypical wargame mold by going to press hex-less. For those who think S&T spells "hex-grid," reading this list may be a bit like spying Abraham Lincoln without his trademark stovepipe hat. If you're not a fan of hexes other than the D&D variety, check out this list for an S&T game or two that might be worth a trip to the table. Availability is no obstacle because used copies of S&T continue to circulate. Check sources such as the BGG Marketplace, eBay, and your friendly Internet or local game store. Of course, it's not all just about back issues; S&T continues to publish new issues about every other month. P.S. The list was built using an automated script, not all the results of which have been painstakingly hand checked. Accurate identification of games eschewing the hex-and-counter mechanic depends on the correctness of the BGG database game record. If you spot an error, please give a shout. Thanks! Public notice: No electrons were harmed in the making of this list. Okay, repeat after me: A square is not a hex. A square is not a hex. . . .
Of potentially more substance is the fact that the squares do not appear to be uniquely identified, as is the custom in connection with hex-based grids. So it's not clear that the squares play a game role similar to that played by hexes in a hex-and-counter game. Can someone check the rules? This back issue, probably because of the famous battle comprising its cover story, tends to command a premium price and so is on my buy list and not yet in my file. Okay, repeat after me: Hexes have six sides / squares have four. Hexes have six sides / squares have more. Hexes have six sides / squares have four. Hexes have six sides / squares have more. . . . The game map certainly looks to me as though it's hex-based. And it's not so much that the game record omits the hex-and-counter mechanic as the list of mechanics is itself omitted, so far. I can't check, because I don't own this game even in principle. This game is reported as using a stylized map rather than the hex-and-counter mechanic. However, the BGG database indicates use of the mechanic. Moreover, a hex grid appears to be present in the gallery photo I've referenced in this entry. I've listed the game provisionally, pending further information. The game map certainly looks to me as though it's hex-based. And it's not so much that the game record omits the hex-and-counter mechanic as the list of mechanics is itself omitted, so far. Can someone who owns a copy settle the issue? I have a copy somewhere--the key word being "somewhere." This game is still forthcoming at the time of this writing. However, it is listed as using an "Area Movement" mechanic. So it does appear not to be a hex-and-counter game. This game is reported as not using the hex-and-counter mechanic but the BGG database, to the contrary, shows the mechanic. Moreover, a hex grid appears to be visible in the gallery photo I've referenced for this entry. I've listed the game here provisionally, pending further information. This game is still forthcoming at the time of this writing. However, it is listed as using a "Point to Point Movement" mechanic. So it does appear not to be a hex-and-counter game. According to the S&T editor, "T-34" is actually a miniatures game. Yes, you read that rightly. 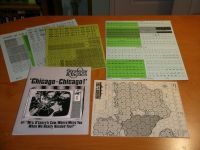 The game was published specifically with a view to gauging reader response and could have opened the door to substantial coverage in S&T of the miniatures scene. That, of course, did not occur except perhaps in some alternative universe.